Home › What is it ? The exciting new field of art and healing. C. Regina Kelly, Quan Yin. Regina is an artist from Maine who has done extensive healing art work in hospice. Her Quan Yin comes from the Japanese Bodhisatva of wisdom who is often portrayed as a woman with 100 or even 1000 hands. 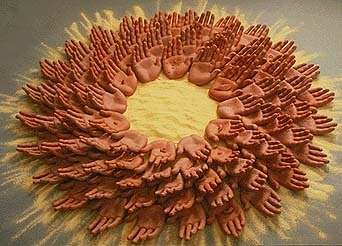 Each hand is holding a different remedy. With this she can cure any illness. Each of the 100 hands on Regina’s piece hold one of seven remedies: corn, stars, leaves, bear claws, eyes, flames, and flowers. She has synthesized curative nurturing symbols from diverse cultures into a universal symbol of compassion and healing. The artist is the gift giver. For many of us, this piece has become a beautiful symbol for the whole field of art and healing. There is an exciting new movement being born today in healing and art. Art and healing are joining and becoming one. The healer is discovering that art, music, dance and poetry have profound healing effects. Doctors, nurses, and therapists are now working with artists and musicians to heal people of all ages with many conditions including cancer and AIDS. Healers have found that art and music, combined with traditional medicine are powerful healing tools. At the same time, artists and musicians have found that art and music heals themselves and others around them. The artists and musicians who have healed themselves of illness are changing the art and music they perform to become healing art. Art and healing is a new field in both the medical world and the art world. In this web site, and in the new field of healing art, when we use the word art we mean all the arts: painting, sculpture, music, dance, poetry, storytelling, journaling, whatever we usually think of as the creative arena. Art therapy and expressive arts overlap art and healing. They are both mature fields that have used art in healing for many years. They tend to concentrate more on therapy, method, and training although many art therapists focus on art itself as the healing process too. In art and healing, the artist is you. No training is needed, the creative process itself heals. We can visualize this movement as an expanding sphere. On one half of the sphere are people with physical or mental conditions, or people with life problems in search of personal growth, healing themselves with art. This side of the sphere, patients and healers using art, includes the fast growing area of art programs in hospitals. On the other side of the sphere are artists making art to heal themselves, others, or the earth. This side of the sphere, artists making healing art, includes most spiritual painting, much relaxing new age music, and some performance art and ritual. The reason we portray the field as a sphere is that we see art and healing as one whole like the earth, healers and patients using art to heal, and artists using art to heal, are both working in parallel and now are joining together to create the field of healing art. What is being born is a whole new way of healing and making art that will change our lives, and the fields of both art and medicine. Use our Healing with the Arts blog as a course in art and healing. Our blog shows you what people are doing all over the earth to heal with art. If you go to our blog, and use the search function you can find out what is happening around the subject you are interested in. For example, if you want to know how art is used with cancer patients, type “cancer” in the search line of the blog and you will see entries about art and healing and cancer care.